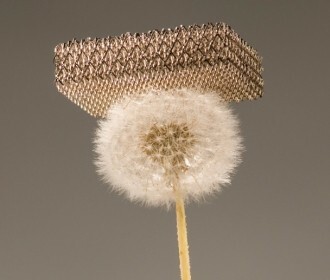 A new ultra lightweight material could impact the future of technology in a large way. Best described as a lattice of hollow metal nickel tubes, the material is nearly as light as air and is able to rebound after being compressed. The material was created by researchers at HRL Laboratories and Composites Center at the University of Southern California and is said to be the lowest-density material. Its volume is measured at 99.99 percent air and its density is 0.9 milligram per cubic centimeter. For comparison, its density is one-thousandth that of water. The interconnected tubes have a wall thickness that’s 1,000 times thinner than a human hair. Researchers believe the material could be used in multiple different applications. When compressed, the hollow tubes buckle under the weight but once the pressure is removed, the tubes rebound to 98 percent of their original height. Such properties could be useful for sound, vibration and shock absorption. Other possible uses could include, but not limited to: improving lithium-ion battery capacity and lowering manufacturing costs, cooling devices for computer components and lightweight construction material for vehicles, aircraft and spacecraft. CNET outlines how the lattice is constructed through multiple steps. Lasers beam ultraviolet light into a reservoir filled with a special resin that creates polymer fibers when the laser makes contact. The fibers follow the path of the light and as such, researchers were able to use multiple lasers to create interconnected fibers. The remaining resin is washed away and the structure is coated in a thin layer of nickel. The polymer fibers are then dissolved, leaving only the hollow nickel tubing. The project was conducted for the Defense Advanced Research Projects Agency (DARPA), the group that recently sourced IBM to develop a cognitive computer chip that mimics the human brain .